Well, I meant to write a post every day, but the trip has been so crazy fun that I’m a bit behindâ€”we’ve already driven over 2,500 miles and are in Santa Fe, New Mexico at this point. 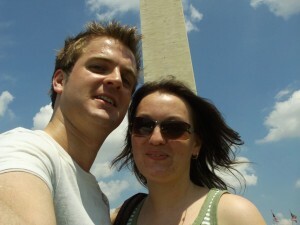 Thursday, June 11th â€” A few months ago my friend Emma from London wanted to take a trip to the States. She’s been over to visit before, but this time it was to do something different other than just roaming around NY. She arrived in NYC on Tuesday, June 9th and wanted to get some shopping out of her system, so I figured I’d let her go at it for a couple days before driving the rental car down from Syracuse to pick her up en route to Washington, DC. Thursday morning I packed up the car with Ianâ€”who was going to get a ride back to Harrisburg from the city the next dayâ€”and made it to New York just in time for her hotel checkout time at 11am. Threw her things in the car and drove to Washington, DCâ€”finally arriving by late afternoon. Checked into our hotel in College Park, Maryland and then jumped back in the car for quick night tour of the National Mall to see the monuments and buildings, which was beautiful. 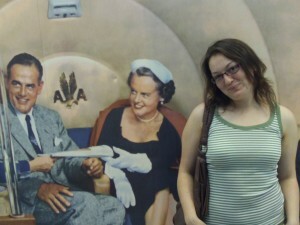 She was exhausted by thenâ€”and so was Iâ€”so we headed back to the hotel. Friday, June 12th â€” We woke up early…kind of (in time for the free breakfast). 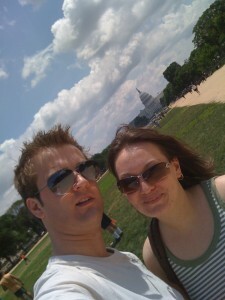 Walked to the DC Metro, which got us into the city to walk the National Mall during the day. Bright blue skies and sunny! Got a bit burned, but I haven’t seen sun like that in awhile so didn’t mind at all. Oh, and thank you, DC Metro, for your A/C trainsâ€”much appreciated. We ran around inside the National Air and Space Museum, which I’ve seen probably 5 or 6 times before, but it’s better every timeâ€”it’s my favorite. Seeing Space Ship One was worth it. Many new exhibits and less construction than the last time I was there two years ago. 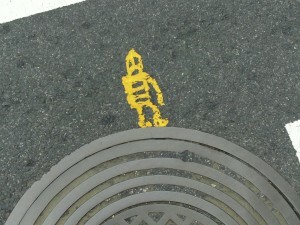 As we headed out, we found a street creature walking on the manhole-moon. Highly appropriate. My apologies for the cars trying to drive over me while I took the photo. Unfortunately, we realized we were miles from the nearest Metro station. Ugh. Walked down Constitution Avenue on the North side of the Mall toward a stationâ€”according to my iPhoneâ€”but they had everything blocked off near The White House for some reason. Had to take a long detour around the front side, but this put us at the perfect spot for photos. No complaints. My iPhone GPS kept saying we were on different streetsâ€”the buildings were blocking a good signal I thinkâ€”and we ended up walking in multiple directions before finally stumbling upon the Metro Center station where we jumped on a train and was greeted by the oh-so-nice A/C once again. Yes, we were drained from the sun and certain death was upon us. Okay, that’s a lie. We just wanted a few adult beverages. Found a restaurant near the hotel for dinner and drinks and had another good sleep before leaving the city in the morning. Previous post: Sirius-XM iPhone app finally on its way!